Okay, this is not a hummingbird either. After a recent blog (see: Not a Hummingbird), a comment came in. So I needed to post another photo of a Gila Woodpecker, in this case a female. Certainly, this is not a hummingbird. It is, however, similar to the bird in the last blog with one important difference. Note the absence of any red on her head. There’s another important insight that appears in both of these photos. Note that the bird has turned its tail sharply toward the hummingbird feeder. This is natural behavior for woodpeckers. They use their tails as a third point to stabilize themselves when on tree trunks. 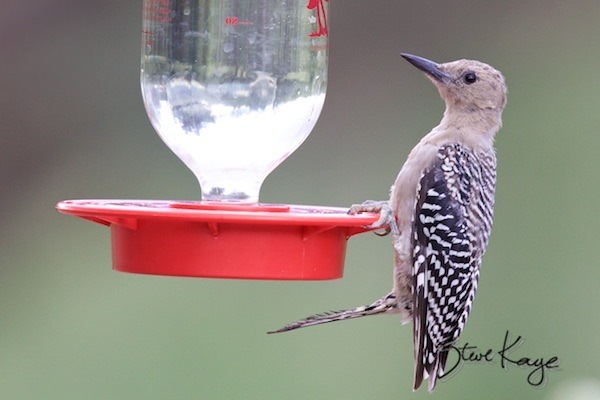 Yep, I have something drinking all the sugar water out of my feeders too…only they are at night. I am thinking bats, but don’t know for sure. Steve, what a beautiful photograph! We have a couple of the red headed woodpeckers in our neighborhood, but I’ve never seen one of these. Is this the female of the same type or a different woodpecker entirely? This is the female, Gila Woodpecker. The male (with a bit of red on his head) appeared in the previous blog. Thanks for asking. Thank you so much for sharing this great information and good knowledge. This is really useful. The birds used their tails as a third point to stabilize themselves when on tree trunks is interesting.